How do you make data available – and valuable – to all the different users in your organization? With a streamlined approach that manages the entire journey, from finding and preparing data to uncovering insights. BI is changing – fast. 2019 will bring changes to infrastructure, data management, AI, service delivery, and more. What’s next, and how will it impact your business? 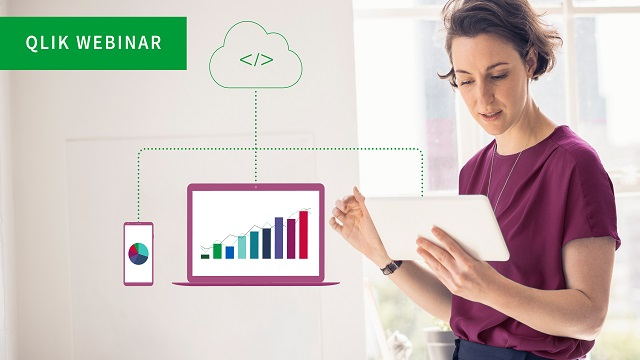 Watch the on-demand replay of Qlik’s most popular webinar. Product and tech leaders agree: BI works best when it’s pervasive, contextual, and actionable. Embedded analytics makes it possible by giving you the power to weave reporting and analytics into existing workflow and productivity apps. But it’s important to have the right strategy – and the right solution. This webinar provides practical advice on embedded BI approaches, best practices, and technologies. Join this session to learn about Qlik's strategy for AI (augmented intelligence) and our new cognitive engine that drives machine intelligence and automation in Qlik Sense. Qlik's approach to AI is to combine human intuition with machine intelligence to unlock powerful discoveries. This session will showcase current and planned AI capabilities, and how the cognitive engine works to provide users with insights and suggestions that harness their intuition. What is data literacy? How does data literacy help organizations realize the true potential and power of their data? This session, presented by Qlik’s Global Head of Data Literacy Jordan Morrow, will help to illuminate what data literacy is, the large skills-gap that is present in the world today, and how organizations can put strong data literacy programs into place to help empower individuals to succeed with data. More and more companies are faced with the challenge of managing an explosion in data along with how to give a variety of users access to this information. This session discusses how Qlik’s data analytics platform can meet this challenge. By providing associative analytics to Big Data repositories, Qlik enables fast and engaging data discovery on massive data volumes while providing users with full access to all the details of the underlying data. The modern software market is rapid-moving and rife with competition. To survive and thrive, today’s Independent Software Vendors (ISVs) need to be nimble and laser-focused on delivering customer value. Outside of the core functionality, top ISVs are seeing substantial impact from embedding analytics into their solutions to bolster their customers’ ability to generate insight in context. Done right, these capabilities help bolster the stickiness of their solutions, improve customer adoption, and drive revenue growth in existing and net-new customers. The next generation of BI technology will rely heavily on machine intelligence – and how that intelligence is used matters. The best solutions will support human-centered analysis, giving users at any skill level the ability to gather, visualize, and analyze data. Join this webinar to hear The Eckerson Group and Qlik explain how augmented intelligence is making analytics even more accessible to users.